First appearance "All Steamed Up"
Latest appearance "Caught in a Draft"
Sgt. Slaughter (born Robert Remus on August 27, 1948) is a former American WWE personality, and semi-retired professional wrestler. From the late 1970s to the early 1990s, Slaughter had success in the National Wrestling Alliance, American Wrestling Association and World Wrestling Federation (now known as the World Wrestling Entertainment). Slaughter appeared twice as a special guest on the The Super Mario Bros. Super Show!, which starred fellow wrestler Lou Albano as Mario. Sgt. Slaughter's character was not a wrestler, but a tough-as-nails army sergeant with a foul disposition, who reports directly to the President of the United States of America. Slaughter enjoys forcing Mario and Luigi to do push-ups, and is described by them as a "bully". He crushes cars with his tank while traveling along city streets, and shows no mercy to anyone. In the episode "All Steamed Up", Sgt. 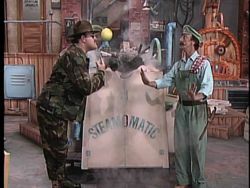 Slaughter employs the Mario Bros. to fix his Steam-O-Matic. After forcing his way through traffic on the Brooklyn Bridge with his tank, Slaughter arrives before the brothers had expected him to, and unbenounced to him and Luigi, Mario had crawled inside to inspect the Steam-O-Matic. Running his own inspection, Slaughter turns on the Steam-O-Matic, and is annoyed by the clunking Mario makes in protest; he takes his anger out on Luigi by forcing him to do push-ups. He then has Luigi carry the Steam-O-Matic to his tank (which was double-parked on top of another car) and the machine's doors finally open, releasing Mario, who had been shrunk by the steam. Sgt. Slaughter next appears in the episode, "Caught in a Draft", in which he has been appointed to train Mario and Luigi for a secret government mission. The Mario Bros. struggle with Slaughter's tough drills, and fail many of his tests, and by the time he feels they are ready for inauguration, both brothers are too exhausted to stay awake. The president then calls and informs Slaughter that a mistake had been made, and he was supposed to be training Ratigator all along. He then orders Ratigator to report to Fort Dix, and leaves the Mario Bros. in peace. This page was last edited on March 11, 2019, at 04:36.